Included with Tri-City membership is the use of our fitness center, operated by Advantage FitPro. Members are also welcome to try 2 free weeks of classes at Advantage FitPro. Get Started with your 2 free weeks or email James for additional info. Center Court Pub and Lounge is the perfect place to relax after a match, a workout, to observe your children while they're in clinics, or to visit with friends. Featuring a fully-stocked bar, popcorn and multiple flat screen televisions, Center Court Pub and Lounge is also available to groups for parties and events. Visit our pro shop for new racquets, tennis bags, socks, and accessories. We also offer demo racquets from Head and Wilson and provide a full range of stringing services. Contact Billy for additional information. 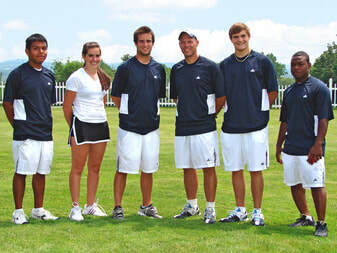 Tri-City's teaching professional staff have years of experience in running tennis programs at area country clubs during the outdoor season. If your country club is interested in enhancing your summer programming with some of the best teaching pros in the Capital District, we would welcome the opportunity to meet with you for a consultation.